The UK driving test has recently come under scrutiny for not being tough enough. With more than a fifth of deaths on British roads involving drivers aged 17-24, the government has issued a white paper proposing changes such as a driving curfew for new drivers under the age of 30 between 10pm and 5am and a probationary driving period of 12 months. With 47.7 percent of UK learners passing first time and an overall pass rate of 47.1 percent in the UK, Ian McIntosh, CEO of RED Driving School, recently spoke to Auto Express to compare driving tests across the globe. In this blog, Ian takes a closer look at how the UK driving test stands up against the rest of the world. Colombia has a particularly convoluted and lengthy process for learning to drive. You can start a year earlier than the UK at age 16, but you must enrol in the Gradual Rearing of Adult Drivers, or GRAD, programme before being granted a full driving licence. In Colombia, anyone interested in learning to drive must first complete an exam which determines the learner’s knowledge of traffic laws, road signs and driving safety rules. On completion of the test, you are issued with a learner’s permit. Once you have this, you can begin your driving lessons. After 40 hours of training, you may take a road skills test to upgrade your licence to a provisional. Once you are 17, or have held the provisional licence for six months, whichever comes first, you can apply for a full licence with conditions. You cannot apply for a full driving licence until you are 21 years of age – this requires a further road skills test that looks at the driver’s ability to operate a vehicle, use turn signals, parallel park and a range of other skills. Have I lost you yet? If we thought the UK driving test was difficult, we really need to look at what it is like abroad before we complain! France also has a rather lengthy system for learners. Unlike the UK, provisional licence holders in France are required to complete a minimum of two years’ worth of training, starting at age 16 with parental supervision and covering no less than 3000km. They are also subjected to reduced speed limits while they are learning. For example, on Autoroutes, learners must drive no faster than 110kph even though the speed limit is 130kph. Australia matches France with a lengthy licence application process. There are typically three stages which new drivers must pass. Drivers begin by acquiring a learner’s permit at age 16, and then progress to a restricted, probationary licence which lasts for roughly two years, before progressing to a full licence. New drivers must also keep a log of how many hours they have spent with their instructor to ensure that they hit a regulated number of hours, with a segment dedicated exclusively to nighttime driving. The pass rates range from 43 percent to 58 percent depending on whether it’s the restricted or full licence being tested. In some countries, it is much easier to pass your driving test than in the UK, although you have to seriously question how road ready and safety conscious the drivers are. Unsurprisingly, this is reflected in the countries’ high accident rates. For example, although you have to wait until you are 18 or older to take your driving test in Pakistan, the test itself is relatively simple. It consists of a theory test and a short practical test, both of which can be taken on the same day. There are no stipulations about the number of practice hours you must have done and the practical test consists of driving through a short course of cones. As you would expect, the pass rate in Pakistan is very high, with around 80 percent of all drivers passing their test first time. The accident rate is also very high, with 16 road accident deaths in every 100,000 inhabitants. Getting your driving licence in America can be a bit arbitrary as driving laws vary from state to state. Some states, like Kansas and Idaho, issue ‘driver’s permits’ to teenage drivers as young as 14, while in other states you have to wait until you are 17. As long as these learners complete a six-month graduated driver’s licence programme, they are able to drive on the roads if they are accompanied by a person who is 21 or over. However, the graduated licensing law does restrict certain driving privileges, such as whether the new driver may carry passengers – and if so, how many – as well as setting a curfew for young drivers to be off the roads. Pass rates across America vary so widely within cities and across states that it’s hard to figure out the country’s pass rate. Even more worryingly, in Mexico you do not even need to take a driving test if you are over the age of 18. In fact, all you need to do is simply buy a licence for 626 pesos (equivalent to £28). Mexico City is one of the most densely populated cities in the world, with four million cars on the road. With no standardised driving test, drivers learn empirically and car crashes are a daily occurrence. Nevertheless, a strict system also has its flaws. The starting age to obtain your licence in South Africa is 18, and you need to pass both a yard test and a road test, where you can lose points for not checking beneath the car for leaks and not using the hand brake every time you stop silently. You will also automatically fail if the vehicle rolls back even just an inch. The pass rate is a low 39 percent and, although the test is purposely hard to improve road safety, it has had unintended consequences, with many learners bribing officials to ensure that they pass. Even stricter than South Africa, however, are Japan’s road tests, which boast pass rates that fall below 35 percent. Although taken on a course, the test resembles real road conditions. Drivers must remain at 30kmph or under at all times, and driving over a curb, failing to stop at a light or junction, and failing to check for oncoming traffic results in instant failure. With people failing for ‘not staying left enough in the left lane’ or ‘not bending down low enough when checking for cats or children before getting into the car’, Japan requires perfection from drivers before they are licensed. Should there be a standardised global driving test? 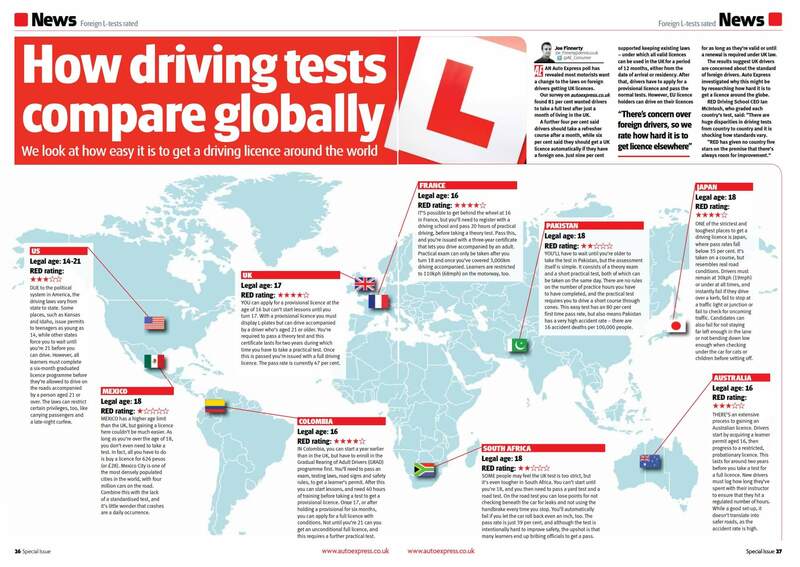 There are huge disparities in the driving test from country to country, and it is shocking how the driving test standard varies on a global scale. For some learners, mastering the reverse park or driving through a congested city centre is challenging enough, so spare a thought for learners across the world where, in some cases, the driving test is far lengthier and more complex than the UK’s.